Posted on Mon, Jan 16, 2012 : 7:37 a.m.
With his handler, SSGT Matt Tennill, TJ — or Tjardo as his given name is written — had participated in several deployments to Afghanistan and Iraq. The military working dog had seen his share of activity while deployed, including a wound to his right leg sustained during enemy fire that he eventually recovered from. He was released back to full duty. After returning, TJ was injured on his opposite leg, resulting in his retirement. Additionally, he needed further attention because of complications from the injury. 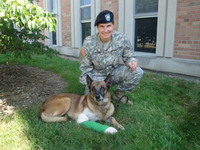 It was then that Tennill, (who by then had adopted the pooch) recalled the veterinarians, Dr. Justin Schlanser and Dr. Barbara Cloutier, who were in charge of caring for the seasoned canine during his time in the Army and decided to contact them to consult; ironically they were both at this point studying at Michigan State University’s College of Veterinary Medicine. The Tennill family traveled to Michigan to have the case handled by the two doctors. Schlanser and Cloutier asked staff at the MSU Teaching Hospital surgery service to review the case — which would involve removing a bone plate on his left leg that was causing the dog lameness, discomfort as well as an infection. Not only did were the doctors able to care for the dog successfully, but due to financial challenges, the cost was offset by a charitable organization: The IRONDOG Fund. The organization was started last winter by Matthew Beal, DVM, an associate professor and Director of Emergency and Critical Care Medicine at Michigan State University's College of Veterinary Medicine, and Christian Weder, a senior veterinary student at MSU. Cooper, with his adoptive family. Beal and Weder know firsthand how disheartening it is when you know can help an animal that is seriously ill or injured, but have the treatment be out of reach due to lack of financial resources. "With the financial downturn," says Beal, "there are people of all demographics, ages and backgrounds who have fallen on hard times through no fault of their own. Especially in the current economic climate, that's becoming more of an issue." The two men decided to devise a way to raise funds by merging their shared interest in competitive endurance sports, and their commitment to caring for animals. That's how IRONDOG came to fruition. TJ isn't the only companion animal to have benefited from the fund. Other pets, like the 2-year-old Boxer named Sasha, who is now healthy and heartworm-free after being diagnosed with and treated for the potentially fatal disease. The course of treatment for Sasha was completely absorbed by the organization. 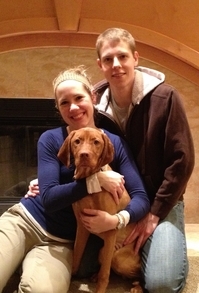 Then there's Cooper, a 9-month-old Vizsla whose owners brought him into the MSU Small Animal Emergency Service after presenting with persistent vomiting. After diagnostic tests, it was discovered that the puppy had a foreign body in his small intestine and a life-threatening infection. Cooper was stabilized by the critical care team, but it was determined that he did need surgery. This presented an unfortunate situation — the surgery was expensive; more than what the family could afford, even with supplementation from the IRONDOG Fund. This isn't an uncommon thing to happen in veterinary medicine, really, and there are two alternatives: euthanasia or a transfer of ownership. In Cooper's case, the latter was the best option, (the owners were very relieved that their furry friend would have a shot at survival) and two senior veterinary students stepped in to adopt him and covered a portion of the costs, with the balance covered by the charity. In fact, the funds donated that helped save the dog's life came from the students and faculty of the GASC Technology Center in Flint, who raised about $1,200 for the IRONDOG Fund through a Walk-a-Thon held last fall. None of this would be possible without the help of others: those who participate in the endurance sports, the people who support them — and donors. With IRONDOG events over the past few months and runners participating in other races to benefit the organization (even in places like Ireland and South Africa), the charity has been able to help 16 clinical cases. Some of those success stories are chronicled further on the group's Facebook page, where people can interact with existing supporters, learn how to get involved and how to make a financial contribution. Bianca Buffa, board member and third-year veterinary student, will be biking 62 miles while representing IRONDOG in Port Austin's Tour di Lago in June. "You're involved in training for the race, but seeing the end result is what really brings it all together," says Buffa. "It's especially gratifying for the many students who are involved in the race — and see a case from start to finish," Buffa adds. "We're excited that other chapters of IRONDOG have been started at other veterinary schools, like the one at North Carolina State University," notes Weder. That offshoot was spearheaded by Marcia Backstrom, former board member of the MSU chapter. Though there are no geographic restrictions on the cases that can be treated at MSU, they must be managed by the VTH. And, not every case meets IRONDOG'S established criteria: the animal must have a good prognosis so that the funds used from the charity have a chance to save its life. The charity is holding its second annual 5K Run/Walk on March 31 on the campus of MSU, and, by all accounts, organizers are expecting an even larger turnout this year, about 300 participants. In 2011, the 5K event raised $5,000, with 184 registrants. A secondary benefit: by getting involved in this particular event, people are able to get out and do something fun to promote their own wellness — even if they're not runners (like me!) — while helping those in need. Organizers are thrilled that Purina has agreed to be the title sponsor of this year’s event. With the company's help and that of other corporate sponsors, 100 percent of race registration fees can then go towards helping those in need. "We're making every effort to recruit new corporate sponsors for the event," says Weder. $20,000 in total money has been raised for the fund since its inception. Click here for more information on registering for the 5K Run/Walk on March 31. Lorrie Shaw is lead pets blogger on AnnArbor.com and owner of Professional Pet Sitting. Follow her pet adventures on Twitter. Tue, Jan 17, 2012 : 11:42 p.m. There is no end, ever, to needy companion animals. Loving, humane euthanasia can be a good thing. Tue, Jan 17, 2012 : 5:01 p.m.
A great idea! Please post reminders as the race date gets closer!